Contains Tree Nuts And Milk. Manufactured In A Gluten-Free, Soy-Free, Peanut-Free Facility. WARNING: May Contain Date Pits Or Nut Shells. Contains tree nuts and dairy. Almonds, Honey, Whey Protein Isolate, Cacao, Banana Extract. Manufactured in a gluten-free, soy-free, peanut-free facility. WARNING: May contain nut shells. Cashews*, Coconut Nectar*, Pea Protein, Carob Powder, Shredded Coconut*. WARNING: May contain nut shells. Contains Tree Nuts. Almonds, Honey, Whey Protein Isolate, Carob Powder, Peppermint Extract*. WARNING: May contain nut shells. Contains Tree Nuts And Dairy. Almonds, Honey, Whey Protein Isolate, Cinnamon, Vanilla. Simple Ingredients. Real Nutrition. Great Taste. We believe the food that goes in your body should adhere to same principles you live by: simplicity, community, rising to the challenge. Made with 100% real food, a super-short ingredient list you can pronounce, and a maximum protein punch, we've got you covered so you can focus on what matters most. This is Rise. Delicious protein snacks made simple, to fuel life's adventures. Each Rise Protein bar has 5 ingredients or less, 15-20g of protein and packed with potassium for optimal recovery. It's the nutrition you need without all the junk you don't. Fueling life's adventures with healthy protein has never been easier. We've packed 15-20 grams of high quality, easily digestible whey or pea protein isolate in each bar to keep you sustained with whole food based, realy energy. 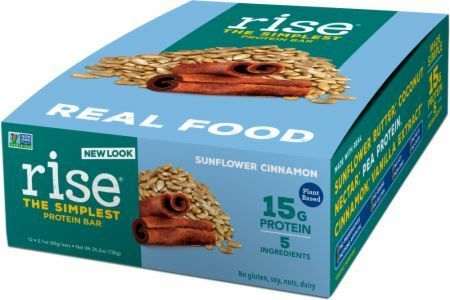 The Rise Sunflower Cinnamon, Chocolatey Coconut and Lemon Cashew Protein Bars are made with plant based pea protein isolate and sweetened with coconut nectar. These bars are not only dairy free but also Vegan. Each protein bar recipe has just the right amount of natural sugar from either honey or cocnut nectar to give it the perfect taste and consistency. We never use artificial sweeteners or sugar alcohols. Gluten, Soy, Peanut Free. Non-GMO. Made in-house, every bar is gluten, sory and peanut free. We are non-GMO, Kosher, and never use preservatives, sugar alchohols or artificial sweeteners. We created Rise to help millions of active people eat simply and rise above one simple step at a time. Share how you Rise #werisetogether.